The other evening the lights were dim and I was giving Roxy a goodnight pet when I noticed a lump in her bed. 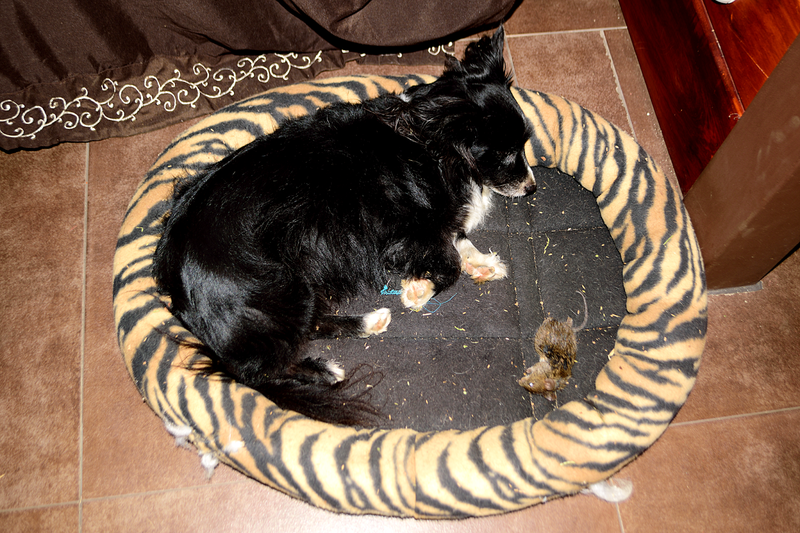 At first I thought she might have puked, even though it's unusual for her to do so in her bed. I turned on a light and saw a dead mouse! Neither of us saw her bring it in the house. After I took a picture we thanked Roxy for her good hunting job and then proceeded to take the trophy and toss it over the cliff. I don't think I've ever mentioned this on my blog, but I do believe Roxy is part cat. She exhibits many cat like behaviors and here's even more proof!